Angels are a part of Christianity, Judaism and Islam, and angels play similar roles in all of these religions even though there are differences in the three religions. Angels perform the job of a bridge between the Almighty and a common man. They are said to be the messengers as well as protectors of faith. They fight evil, keep a track of all good and bad deeds of people, as well as carry out the orders given by God. Angels guard heaven as well as hell. The other meanings of angel tattoos are peace, beauty, innocence and purity, spirituality, protection, predanost, faith and love. Some angels are depicted as fun loving and peaceful cherubs while some are shown as powerful, strong and filled with God’s strength of God, like the guardian angels. The size of angel tattoo depends on the person. He can get a small tattoo made or a large one. Some of the large angel tattoos cover the entire back. Often the tattoos are pictured with wings. Za tatoo se običajno vzame iz klasične umetnosti. A number of tattoo designs have their origin in middle age and Renaissance art. 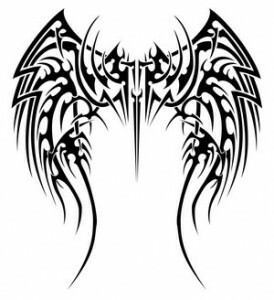 The angel tattoo designs are usually combined with swords, harps, trumpets, banners, bows, halos, clouds, fairies, a cross or a devil. The angel tattoo designs can also be combined with tribal tattoos. 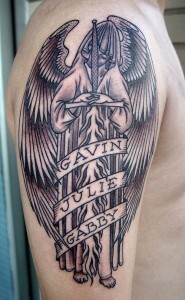 Now lets see what are the various angel tattoo designs.